At 2:33 AM on January 23, 2019, a citizen called Police Dispatch to report a possible drunk driver who was traveling northbound on the Glenn Highway. The caller stated the driver of a Ford Ranger pickup was swerving all over the road. Following the dispatcher’s instructions, the caller followed the Ranger from a safe distance and provided location updates. Officers were able to catch up with the Ford as it took the South Eagle River Exit. The mid-shift patrol officer got behind the Ranger and followed it for a bit. The officer witnessed the driver, later identified as 40-year-old Kenneth G. Stepetin, drift across his lane of travel several times. The officer activated his emergency lights. Stepetin swerved to the right, ran up on the curb, and then pulled back onto the roadway before turning into a business parking lot at Monte Road and the Old Glenn Highway. Stepetin initially stopped in the lot, but then accelerated at a high rate of speed as the officer began getting out of his patrol car. Stepetin drove northbound on the Old Glenn at speeds over 70 mph; that area is posted 35 mph. Due to the traffic conditions, officers were able to safely pursue the suspect. Stepetin was unable to maintain his lane of travel, and lost control. Stepetin braked hard, missed the corner with Schroeder, left the roadway on the northwest corner, struck a power box, and went up into the snowbank where he got stuck. As officers were positioning their patrol cars around the Ford, Stepetin exited and ran from the area on foot. The officers gave chase and verbalized several commands which Stepetin ignored. As one of the officers got close, Stepetin pushed the officer away. After multiple Taser warnings, Stepetin was tased twice but neither had an effect as the probes did not penetrate the clothing. Stepetin continued to run, got tangled in the Taser wire, tripped over his own feet, and fell to the ground. As officers began the handcuffing process Stepetin tensed up and attempted to pull his arms away. After he was cuffed Stepetin was walked back to a patrol car without further incident. There were no injuries. Stepetin showed signs of impairment. 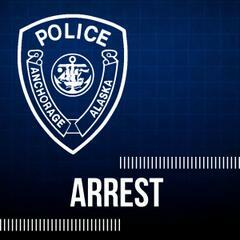 He was transported to the Anchorage Jail for processing; his blood/alcohol level was almost three times the legal limit. Stepetin was remanded on the charges of Fail to Stop, Operating under the Influence, Resisting, and Leaving the Scene of an Accident.